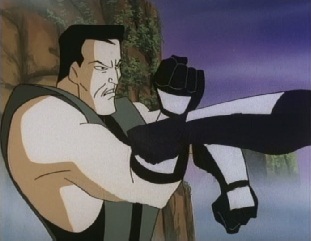 At the Mortal Kombat base, Stryker is on a training course, and hits 9 out of 10 targets. 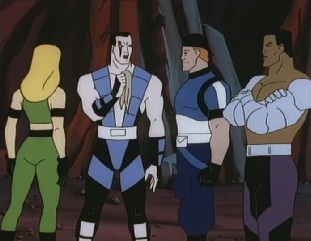 Jax says riot squad guys like Stryker aren't that bad, and Sonya says that he's nearly as skilled as special forces grads like herself. 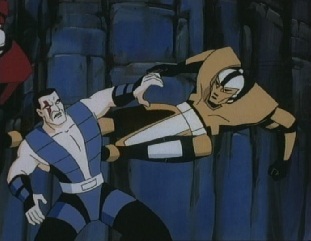 However, Sub-Zero appears, and says Stryker was not concentrating enough -he should have hit all 10 targets. Stryker wonders if he could do better, and he says he could -blindfolded. 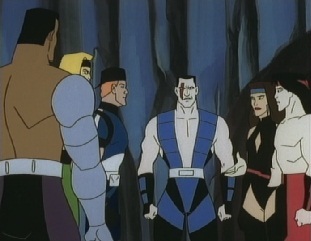 Jax and Sonya make them make a bet out of it, and Sub-Zero says the winner can choose his own reward. 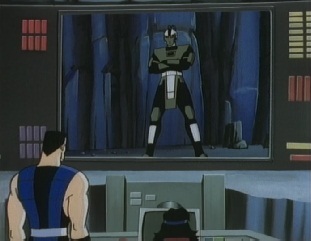 He has a go and gets all 10 targets with ease -telling Stryker that his ninja training sharpens the body and mind. 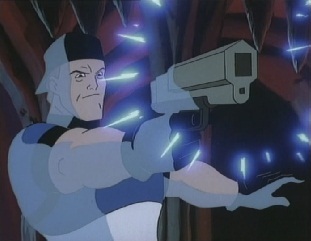 Stryker says his run shouldn't count because his ice powers are a none regulation weapon. 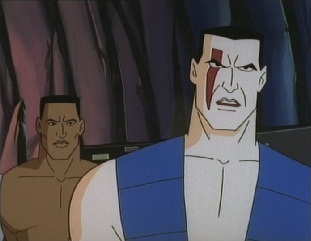 Jax suggests he'll go and find Stryker an ice dispenser to use on his next run. Nightwolf then contacts them, saying play time is over as he has discovered another rift. 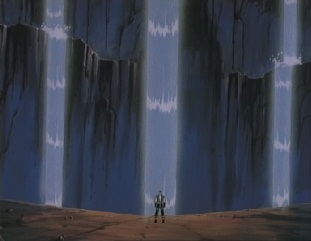 The entire team report to him, and he tells them a portal has appeared near the Grand Canyon. 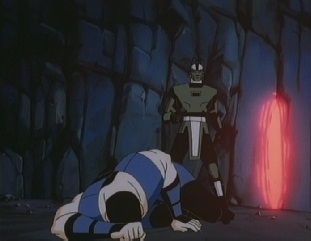 Nightwolf manages to get a visual of the portal, but it is surrounded by thick smoke. 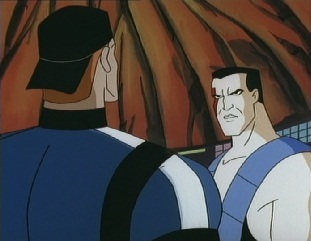 He is about to go to infrared when Sub-Zero tells him not to bother -he knows who is there. 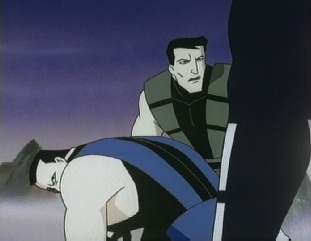 Stryker demands to know, and after Kitana asks, Sub-Zero reluctantly tells them that the intruder is a man called Smoke -another ninja who he used to call a friend. 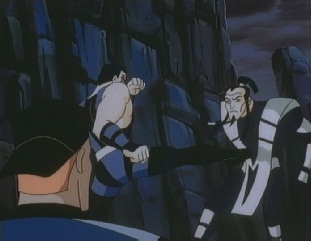 Many years a go, they trained together in China with the Lin Kuei clan, where Sub-Zero mastered his skills, although it was often tough on him. But he met another student who could bring particle matter together to create smoke. 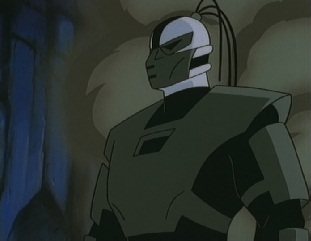 Sektor and Cyrax also trained with him...back when they were still human. 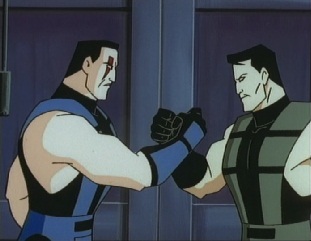 Sub-Zero and Smoke became close friends, considering each other brothers. They vowed to always honor their friendship, and swore never to fight each other in true combat. But then, everything changed. 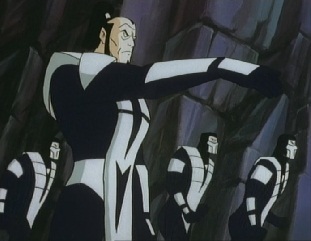 The ancient masters decided that the Lin Kuei should automate, combining the souls of their finest ninja assassins with the bodies of advanced cybernetics. 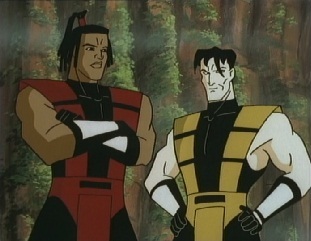 Sektor and Cyrax were among the first to be converted, and Sub-Zero and Smoke saw what had happened to them. 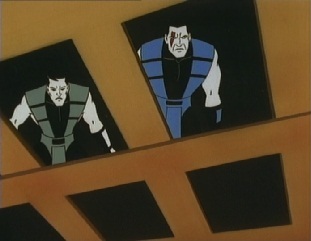 Neither of them wanted to share the same fate, so the two decided they would leave the Lin Kuei clan. 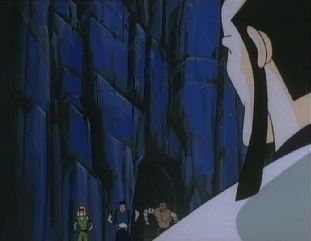 However, escaping from the clan was not so simple, and one of the ancient masters sent out many clan members to hunt them down. ...Smoke did not. 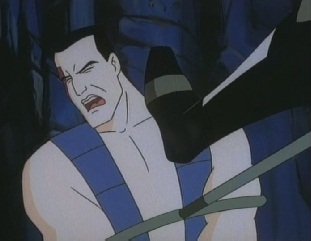 Sub-Zero says Smoke fought with honor, but he was no match for the master. Oniro defeated him. 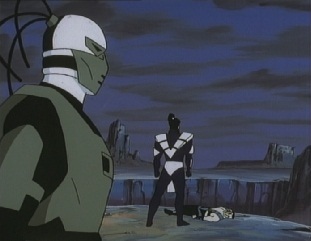 However, Sub-Zero then appeared and pushed Oniro back. 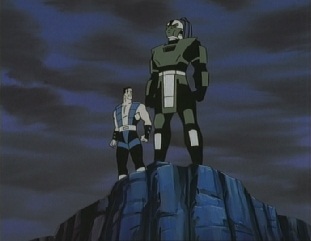 Oniro wanted to know why they were defying him, and Sub-Zero told him that they did not want their souls enslaved by machines. 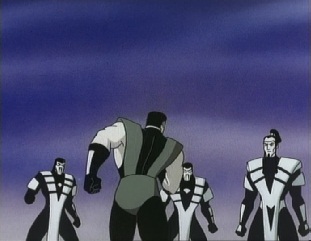 Oniro easily got Sub-Zero off him and told them that the Lin Kuei is the master of their fates -not them. 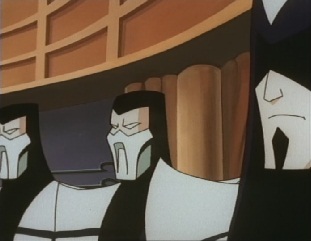 More clan ninjas showed up, and whilst Sub-Zero beat a few down to clear a path, Smoke refused to follow him. 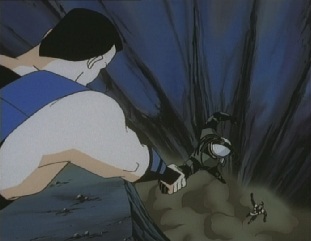 He instead stayed behind and fought on, allowing Sub-Zero to escape. Sub-Zero did get away, but Smoke was gone. 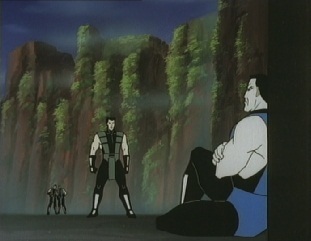 Back in the present, Sub-Zero says he failed Smoke, but the others say he cannot blame himself. 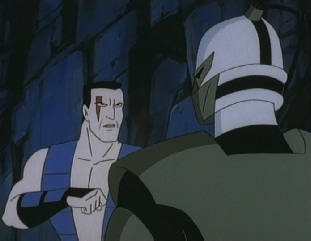 Sub-Zero says he must, as he escaped whilst Smoke was converted into a cyborg ninja. 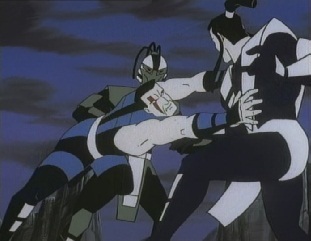 Now, Smoke has been programmed by the Lin Kuei to hunt him down. 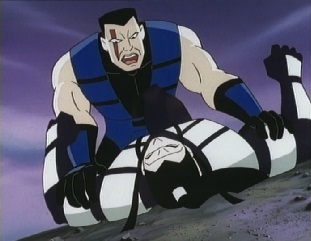 If he does catch him, he will take him back to the Lin Kuei so he also can be converted. 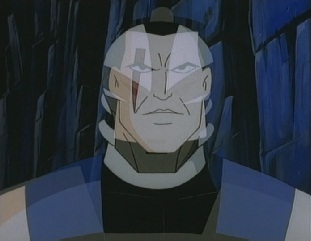 Sub-Zero has always believed that beneath the cyber's shell, there is still a soul. He wants to know for certain and says he will go and face Smoke -alone. 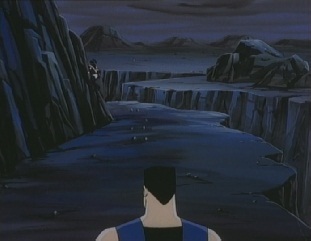 Later on, Sub-Zero appears where the rift was after a long journey. 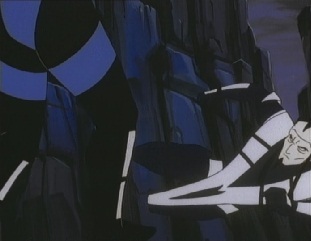 He reaches it and Smoke appears, saying he has come for him. 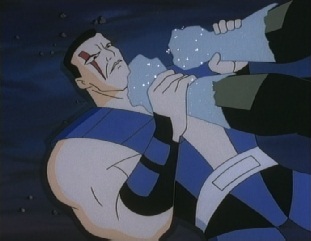 Sub-Zero says he knows, but he refuses to fight him. 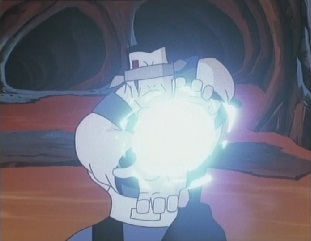 However, Smoke just states that he has been programmed to capture his target, and fires a spear from his chest which restrains Sub-Zero. Smoke wastes no time in kicking his target. 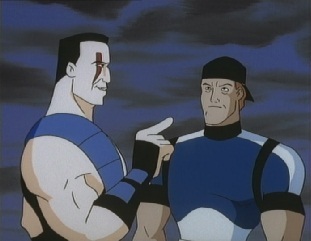 Sub-Zero asks Smoke if he remembers their oath, but he does not respond, and kicks his target again. 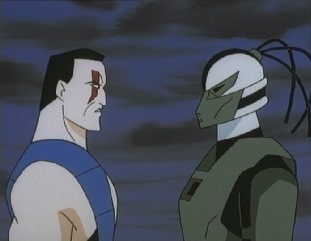 Sub-Zero tells Smoke that they can put a shell around him, but they cannot take his soul. Smoke responds by throwing him. 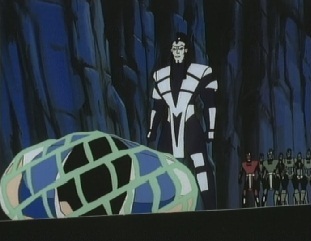 But then another person appears out of the portal: Oniro. He says that Smoke cannot remember what happened in the past, but he can. 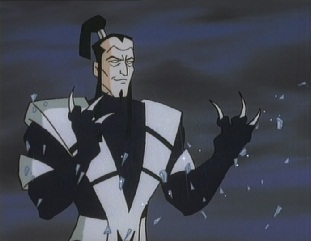 He knows that Sub-Zero is the only ninja to ever escape from the Lin Kuei, but now he will forfill his destiny and become a cybernetic ninja. 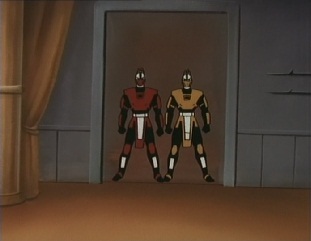 To make things worse for Sub-Zero, more cyber ninjas walk out of the portal, including Sektor and Cyrax. 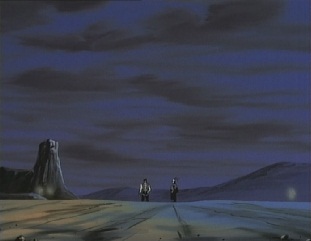 Oniro sends his forces to attack. 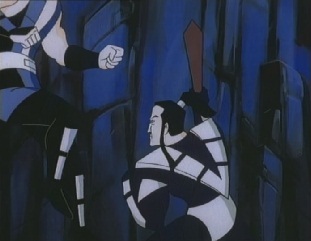 Hopelessly outnumbered, Sub-Zero is soon caught in one of Sektor's nets and defeated. Oniro says he will soon become like Smoke, but then Sonya, Stryker and Jax arrive. 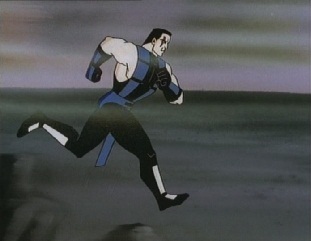 Stryker throws a flash grenade out which blinds the evil ninjas. 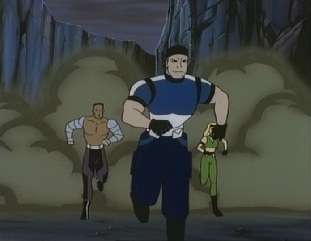 Stryker frees Sub-Zero, and the latter resumes fighting Oniro. 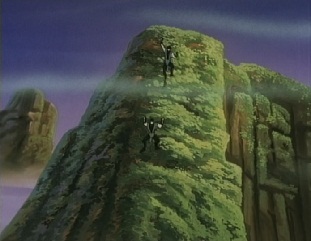 Oniro pulls out some kind of sword and fights back, and whilst his cyber ninjas fight a losing battle against the new arrivals, he eventually retreats up the side of a cliff. Sub-Zero follows, only to find Smoke up there instead. He still refuses to fight his old friend, and tries to get him to remember their vow, as Oniro screams at Smoke to execute his programming. 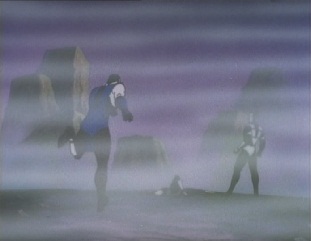 However, Smoke creates lots of smoke around himself, and soon the entire area they are in. 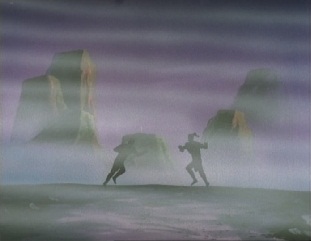 The team move through the smoke and find more ninjas to fight, who they battle and destroy. As the smoke clears, Oniro sees that Sub-Zero and Smoke are gone, but he says there is no escape this time. 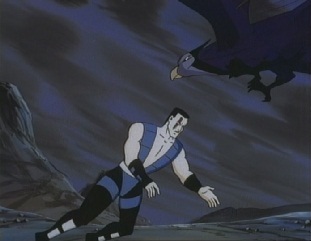 As he is a shape-shifter, he transforms himself into a bird and flies away. 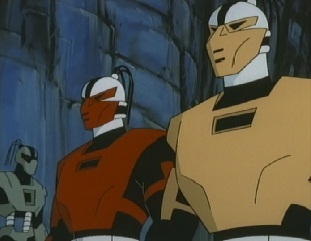 Meanwhile, Sektor and Cyrax have come to the conclusion that they are fighting a losing battle, and decide to retreat with a few other cyborgs. 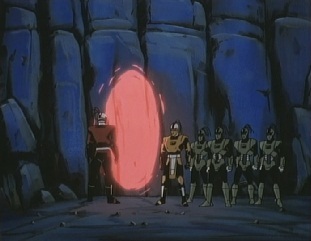 Raiden then appears and seals up the portal the cyborgs just used. 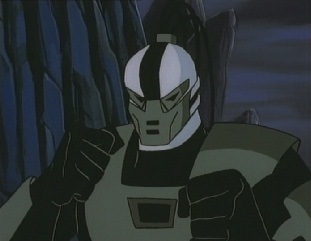 The team ask him about Smoke, and if he really is a machine, or if there is still a part of his soul inside the shell. 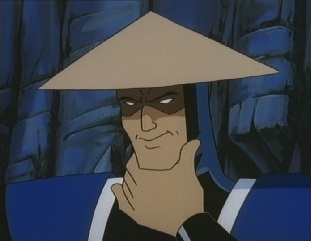 Raiden thinks about it...and says he has no idea. 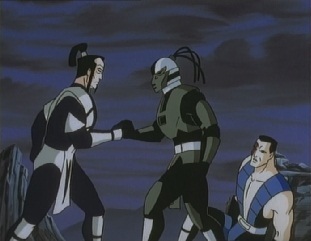 Friendship makes a deep impression, and he hopes the Lin Kuei didn't totally erase it. But the real question is where are they now. 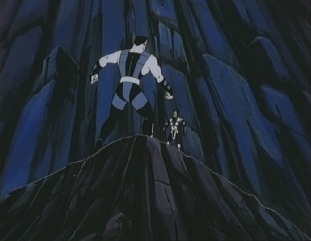 A short distance away, Smoke has taken Sub-Zero aside, as he wants to have a one on one fight with him. 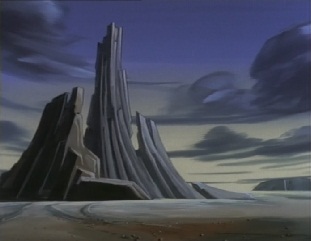 Whoever wins will cast the loser into the abyss below. 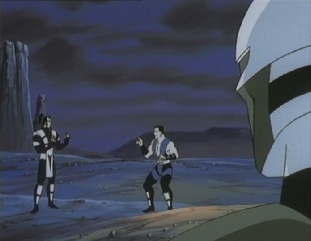 Sub-Zero refuses, reminding Smoke again that he made an oath with him to never fight like that. 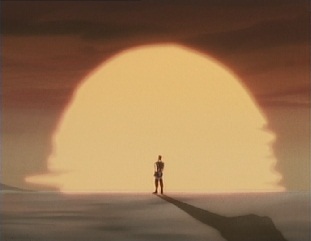 But then Oniro says if he won't fight an old friend, maybe he will fight an old enemy, and swoops in to attack. 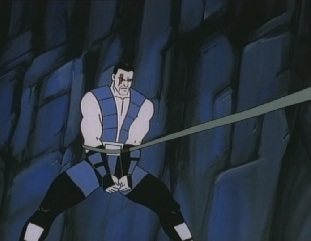 He shifts back to his human form, grabs Sub-Zero and says that the Lin Kuei's honor must be satisfied. 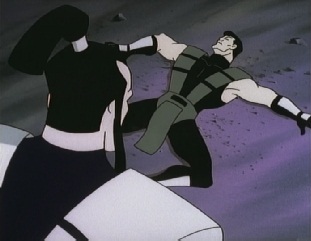 Sub-Zero gets him off and says there is no honor in this, and freezes Oniro's hands. 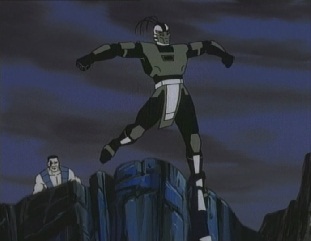 However, his ice powers are not strong enough to stop Oniro, who shatters the ice whilst changing his hands to claws. As this is going on, Smoke watches. 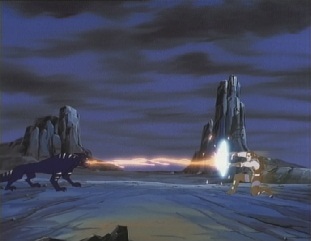 Oniro shifts into a tiger form, which breathes fire. 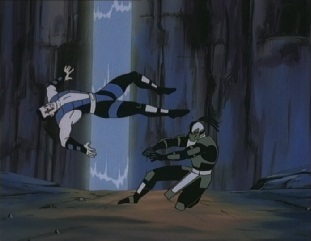 Sub-Zero tries to stop it with his ice, but fails and is blasted back to the edge of a cliff. 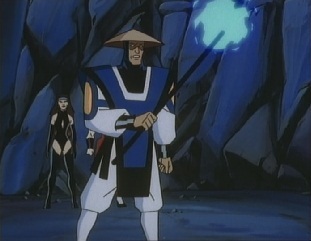 Oniro shifts back to his human form again and says that Sub-Zero's soul is his. 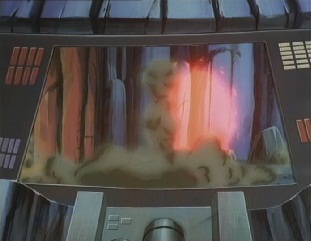 This triggers a memory in Smoke's mind -Oniro said the exact same thing to him all those years a go, when he started the automation process on him! 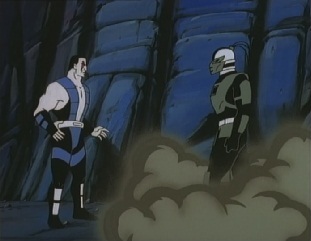 ...but Sub-Zero saves Smoke. 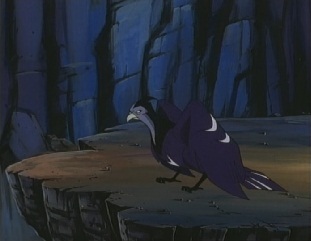 Oniro falls, but shifts into his bird form and flies away. Smoke is pulled back up as Sub-Zero says he did remember their oath. 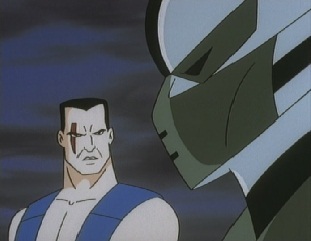 Smoke says he does, however, Sub-Zero is still an enemy of the Lin Kuei, so they can no longer be friends. As he walks off and disappears in his self created smoke, he says one last thing -he will honor their oath. 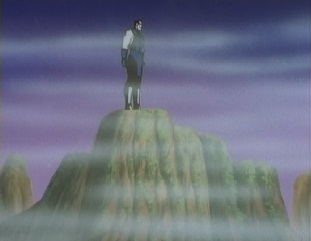 Later on Sub-Zero stands alone, saying that he will meet Smoke again one day. 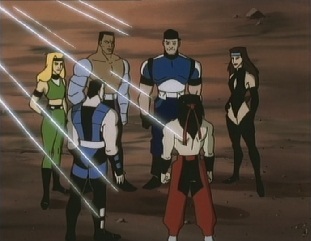 The rest of the team then show up, as Sonya says he was right about Smoke's soul. 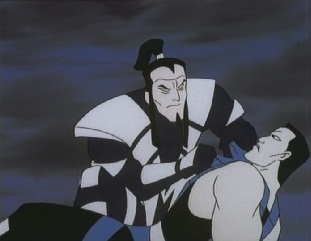 Sub-Zero says that the soul is the one thing nobody can take. 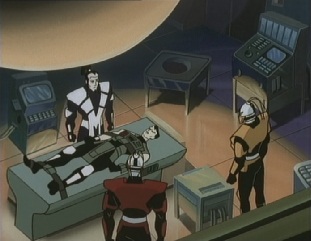 Jax reminds him that there are plenty of things he could take from Stryker -thanks to that bet he won earlier. 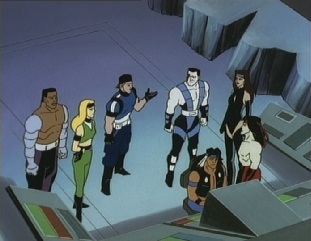 The team suggest his watch, favorite baton or cash, but Sub-Zero has a better idea -how about Stryker becoming his student for a week? 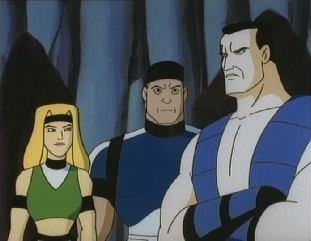 Stryker isn't so sure about that, but the rest of the team are, and Sub-Zero is sure he can enlighten him. 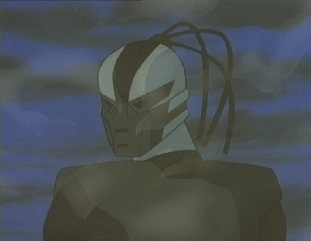 In the games, the human smoke (who appeared in Mortal Kombat II and was playable in Ultimate Mortal Kombat 3) always had a mask on, whilst in this episode, he has no mask. 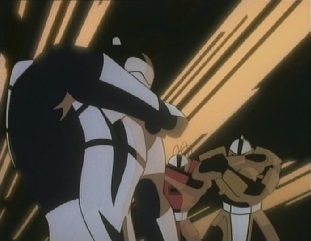 There is a pretty bad animation error in this episode where the wrong background was used in one shot, making Oniro and Sub-Zero fight in thin air. Oniro was never in the games, and was made up just for this episode. 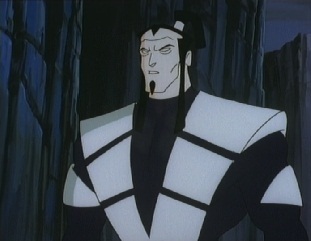 He shares some similarities with Shang Tsung, as he can shape-shift and even says "Your soul is mine!" 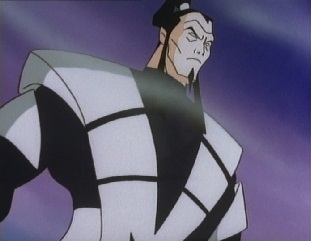 as Shang did in the 1995 live action movie.